BNKC Backround, Vision, Mission and Goals - BNKC (Cambodia) Microfinance PLC. 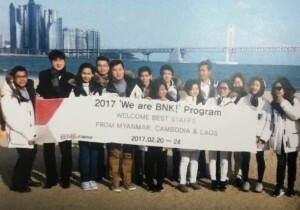 BNKC (Cambodia) Microfinance Institution Plc. formerly named KBSC (Cambodia) Microfinance Institution Plc. is a Public Limited Company which received official license from National Bank of Cambodia on 07th May, 2015. BNKC has a paid-up capital of USD 15 Millions and 100% shareholder-BNK Capital. 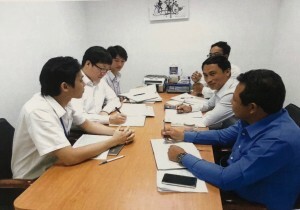 The aim of BNKC is to provide job opportunities and the best financial services to Cambodian people as well as to contribute to Cambodia's economic development. 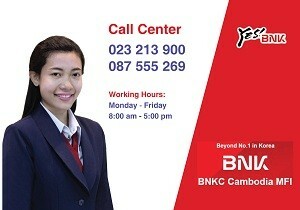 BNKC’s vision is to provide the best financial services to Cambodian People with sustainable growth. BNKC’s mission is to perfect a strong financial group that combines size and profitability. 1. Build unique status for every business line. 4. Lead the way to make BNKC a financial hub. 5. Strengthen Control Tower role. 6. Establish the group’s corporate culture. 7. Strengthen social Responsibility Management.